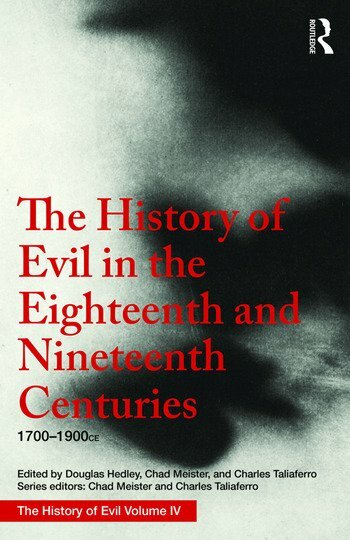 The fourth volume of The History of Evil explores the key thinkers and themes relating to the question of evil in eighteenth and nineteenth centuries. The very idea of "evil" is highly contentious in modern thought and this period was one in which the concept was intensely debated and criticized. The persistence of the idea of evil is a testament to the abiding significance of theology in the period, not least in Germany. Comprising twenty-two chapters by international scholars, some of the topics explored include: Berkeley on evil, Voltaire and the Philosophes, John Wesley on the origins of evil, Immanuel Kant on evil, autonomy and grace, the deliverance of evil: utopia and evil, utilitarianism and evil, evil in Schelling and Schopenhauer, Friedrich Nietzsche and the genealogy of evil, and evil and the nineteenth-century idealists. This volume also explores a number of other key thinkers and topics within the period. This outstanding treatment of the history of evil at the crucial and determinative inception of its key concepts will appeal to those with particular interests in the ideas of evil and good. Douglas Hedley is Professor of the Philosophy of Religion at the University of Cambridge, UK. Charles Taliaferro is Professor of Philosophy and Chair of the Department of Philosophy at St Olaf College, USA.